.The 394 Shuttle Press is a high production, twin station heat transfer press. It is available in two different heater block sizes: 16" x 20" and an oversized 20" x 25". Designed for optimal pressing efficiency in a demanding heat transfer production environment, the 394 Shuttle Press removes operator inefficiency and pressing delays in a compact and user-friendly design. By utilizing two shuttling tables, the press allows for constant pressing, and the operator is able to load and unload work while the opposite table is being pressed. The next set of work is immediately available for pressing after the prior cycle, therefore minimizing both operator and press idle time. .Coupled with the Digital Knight state-of-the-art control system, and a solid steel and casting frame structure, the 394 provides extended dependable service in even the most demanding production environments. The 394 exerts up to 12,000 pounds of force, the capacity necessary for Embossing. The high wattage heater in the 394 will keep up with any heat demand, ensuring absolutely no heat recovery issues often found with standard presses. The 394 is configured for standard T-shirt & textile printing, and is easily adapted for other substrates such as ceramics, woods, metals, mousepads and fusing & laminating applications. * Twin shuttle dual workstations for fast, high speed production by a single operator. * Open access emergency release buttons. * Heat platen, wiring, and all controls are mounted on a solid stationary four-post channel frame support to insure minimal maintenance. * Smooth roller bearing slide rail with 3/8" aluminum tables: independent surrounding drape tray for garment overhang. * Permanent mounting on casters for easy loading, unloading and in house movement. * Built-in safety alarm and circuit protection OSHA approved dual safety operation controls. * Lifetime Warranty on heat platen, Full one year warranty on machine. * Machine provides ability to apply a variety of special effects decorating as well, such as multimedia foiling, sublimation, hot-split transfer, color copier imaging, and deep embossing. * Custom sized & shaped bottom table castings available for specific layout requirements. 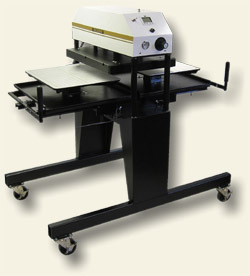 This page covers the Geo Knight & Co line of standard sized automatic heat transfer presses. These presses significantly add to the productivity of heat transfer pressing by relieving the operator of the major manual tasks normally associated with manually clamping presses. .Featuring smooth air operated automatic pressing at the push of a button, these automatic presses take all guesswork out of the transfer process, replacing it with a high volume output of consistent and reliable heat pressed product. .There are two types of standard sized automatic presses. These are the shuttle press and swing-away designs. The shuttle presses offer a two station configuration where the operator may load and unload one table while the other is under the heat platen. When the heat platen finishes pressing one of the tables, the other is shuttled under the heater block. This allows for optimal use of the heater block, with minimal time wasted while there is no product being pressed. The other design is the same as the Manual swing away presses. except air operated, of course. The automatic swing away presses feature convenient table top operation with the ease and power of push button activation.